Aptech Malviya Nagar Invites Applications for Job Oriented Courses For all graduate and 12th Paas Students In Delhi-NCR Now Aptech Malviya Nagar The Real IT Giant Offers Limited Seats For Job oriented Training. The Live Project Training Module Of Our Course Can Make A Huge Difference To Your Profile And Career Prospects. So Don’t Settle For The Second-best. Choose WINNERS I.e. 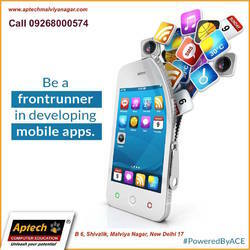 Aptech Malviya Nagar Training At Aptech Malviya Nagar Brings You Directly In Touch With Industry Experts & Sets The Right Base For Leading Vendor Certification. Our Alliance With Leading IT Corporations Such As MICROSOFT, RED HAT & ORACLE Provides Us With Valuable Input For IT Education.